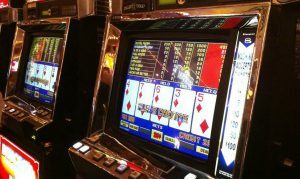 Video poker is one of the most popular games at the top online casinos. With a low house edge, a reasonable chance to beat the machine, and fun game-play, video poker eventually hooks just about everyone that plays it. In fact, video poker is so user-friendly that any beginning player can enjoy it. You put one to five coins in the machine. You are dealt five cards. You discard 0 to 5 cards to make the best poker hand you can. The machine deals you replacements for your discards. The player is paid for the final value of the poker hand using the payout schedule for the machine. You must, of course, know your poker hands. There are dozens of variations of video poker. The most popular are some version of Jacks or Better. Consult our article on all the variations of video poker. Beginners should start with Double Bonus Jacks or Better. It has the simplest payout table while still having a high payout percentage. Not all video poker machines are created equal. Some offer good payouts all the way down, some offer giant bonuses but skimp on the payouts for lower-value hands, and some skimp on medium hands. Unlike typical slot machines, video poker payouts are listed right on the front of the machine, so you don’t have to guess what they are. If you’re a beginner, don’t work too hard at this; simply check the payouts for a full house, flush, and straight. All else being equal, pick the machine with the highest payouts you can find for these three hands. A 9/6 Jacks or Better machine pays out 9 to 1 on a full house and 6 to 1 on a straight. An 8/5 machine pays out 8 to 1 on full house and 5 to 1 on a flush. A 10/7 machine pays out 10 to 1 on full house and 7 to 1 on a flush. Obviously, the higher these numbers, the better the overall payout percentage. What is volatility? It’s the difference between the payout percentages posted on the machine and the actual individual payout percentages. For a low-volatility machine, you can expect your payout percentage to be close to the posted payout percentage if you play smart. Low-volatility machines pay more often, but pay smaller amounts of money. For a high-volatility machine, you can expect a payout very different from the posted one. You will lose everything much of the time. The up side is the opportunity to win a large amount of money, but this is rare. As a general rule, the more and bigger jackpots a machine offers, the higher its volatility. Jacks-or-better double bonus machines are the ideal volatility for the beginner. Consider this the unbreakable rule of video poker: always bet the maximum number of coins. Double bonuses for the royal flush are only available for the maximum five-coin bet. If you choose to bet fewer coins, the payout percentage drops dramatically. Choose a machine that allows you to make your bet limit with five coins. Don’t use your gut when playing video poker. Use a set of rules. Remember, casinos make money from bad play. The posted payout percentage is for the good players. Bad play can easily demolish that to 2%. The following provides the best beginner’s strategy for playing video poker. It is optimized for the maximum bet on a Double Bonus 9/6 Jacks or Better game. While it doesn’t perfectly apply to other machines, it will get you close to that machine’s payout percentage. This hand is both a high pair (ranked 11 on the list) and 4 cards to a royal flush (ranked 7). What do you do? Choose the higher ranked hand on the list (4 cards to a royal flush). Discard the queen of hearts and go for the royal flush. The payout on a royal flush is 800x your bet for five coins, but the odds for a royal flush in this hand are 1 in 46. This is far better bet than taking the guaranteed 2:1 return on the high pair. Remember: any strategy only wins if you play it consistently hand by hand. If you don’t, you will lose money as most beginners do! Final Tip: all the video poker variations have a free version online. Make sure you try out any hand-by-hand strategy on the free version first!